Was it the nozzle cooling outlet line that broke? Do you have an idea why it broke? This was one of those moments that made me laugh as well as cry for you. It really is an amazing video. Unfortunately, the cost is rather high. I hope you can rebuild the engine so you can do more testing. 2 cameras down. Amazing the SD card survived. 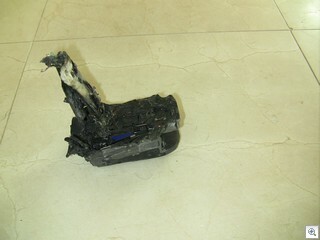 If U use a cheap digicam, the engine will never blow up. If U use an expensive camera, it'll always malfunction. john carmack would be proud. Recovering a working SD card is amazing!